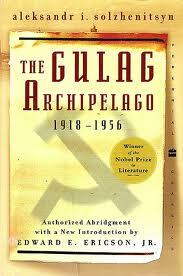 Only post-apocalyptic fantasy novels could come close to the otherworldly horror that Solzhenitsyn writes about. This is the kind of work that inspires both thankfulness and watchfulness in the reader – there is something chilling but deeply relatable about the outrageous, disbelieving silence that surrounded the ongoing atrocity of the Russian prison camps. Despite the language barrier, grim subject matter and frequent use of sarcasm, the whole work is suffused with gentleness, humanity, depth and insight, the product of a spirit made beautiful through the tempering of much suffering. I feel the need to read the complete, 3-volume work, since the abridgment felt awkward and cut out an extremely impactful section that I remembered from a previous encounter with a different version of the book, leading me to wonder what else has been sacrificed to the short attention span of the Westerner.